The Canada Border Services Agency (CBSA) has demonstrated an increased vigilance in recent months. This approach goes hand in hand with Canada’s international obligations to combat terrorism and organized crime, as well as the Harper government’s emphasis on ‘law and order’. We all benefit when close attention is paid to passports to verify the identity of travellers. Similarly, CBSA officers often play a key role in thwarting international arms smuggling and child kidnapping. However, the more intense scrutiny by CBSA officers can have some less than pleasant consequences for the great majority who do not consider themselves criminals or terrorists. In addition to sending what appears to be a higher percentage of persons to ‘secondary’ inspection when arriving in Canada, whether by land or air, which can lead to long delays clearing customs, there is a heightened scrutiny of goods being brought into the country. Persons entering Canada are finding that CBSA officers are showing very little leniency in cases where the officers believe one has under evaluated some goods purchased outside the country or failed to declare all of them. Of course this flows from the government’s desire to tax, tax, tax whenever possible. Claiming you just plain forgot all about that brand new Donegal knit sweater in your bag will not get you very far, even if you protest that the garment is destined for a poor orphan you met at Mass. A full and complete declaration is always the best policy. Obtain receipts for any items purchased outside the country and have the receipts on hand when entering Canada. This will help determine duties or taxes owing, considering your eligible deductible amount in relation to the length of your trip outside Canada, if applicable. The receipts must show the full value actually paid for the merchandise. Do not be tempted to obtain false or misleading receipts. CBSA officers are well-trained to sniff out suspicious situations and have access to many sources to verify the market value of goods in the country where you purchased them. If you are caught and you choose to bring the goods into Canada rather than to forfeit them at Customs, you will be obliged to pay the regular taxes and duties as well as a significant penalty. It is important to underline that if you are not a Canadian citizen, given the above-mentioned vigilance, it is very likely you will face proceedings under the Immigration and Refugee Protection Act. The result could well be a Deportation Order for having made the false or misleading declaration to the CBSA official. If you are a Permanent Resident, the only way to remedy a Deportation Order would be through an appeal at the Immigration and Refugee Board (IRB), a process which takes about two years until the IRB studies your case. Then you might lose your appeal and have to leave Canada, or, even if you are permitted to remain, strict conditions may be imposed for three, five or even seven years. Any plan you might have had to apply for Canadian citizenship will be on hold throughout this period. If you are in Canada with status only as a visitor, worker or student, unless there were some technical errors of law behind the Deportation Order (not likely), you will have no appeal rights. You will have to leave Canada and obtain special permission if you wish to return. In addition, if you ever seek admission to any other country, you would likely have to declare your deportation from Canada on immigration forms of such other government, which would surely complicate matters. If all of this is not enough, and especially in cases of false declarations and phony receipts, the CBSA officer may recommend that the RCMP be brought in to lay criminal charges whether under the Customs Act or possibly the Criminal Code. You would be looking at a possible fine or even imprisonment and a resulting criminal record, as well as immigration problems for non-citizens (Deportation Order) and potential employment and travel issues for citizens and non-citizens alike. For example, the USA is well-known for prohibiting entry to a person whom it considers to have been convicted of an offence involving dishonesty or what they term ‘moral turpitude’. So the next time you are coming to or returning to Canada, do not take chances with your future. It is better to pay some duties if necessary rather than to face potentially severe consequences for a little bit of dishonesty. Stephen Fogarty is a member of the Quebec Bar and of the Law Society of Upper Canada. He practises immigration and citizenship law at his office Fogarty Law Firm in Montreal. His Twitter handle is @Stephen_Fogarty and the Firm’s website is www.fogartylaw.ca. 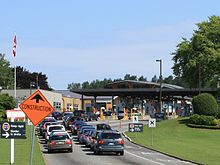 Photo credit: Cars approaching Canada Customs at Surrey, B.C., 2008/07/07, by dherrera_96, Wikimedia commons. The opinions expressed herein are those of the author and do not necessarily reflect the views of any other person. An earlier version of this article appeared in the Fall 2011 newsletter of the Ireland-Canada Chamber of Commerce, Montreal Chapter, www.icccmtl.com.